Full-format coverage and a sharp look are what you get when you put the Smith Outlier Sunglasses on your face. Unlike other specs, these don't cut corners, neither with the stylish Evolve frames nor the scratch-resistant Carbonic lenses, they hold. Of course, they give you complete protection from UV rays, and the polarization will help cut through glare, but the real treat is the ChromaPop™ technology giving you enhanced contrast and richer colors everywhere you look. These sunglasses are fantastic. So fantastic I had to order a second pair of them with Chromapop Polarized. Needless to say, I will never be returning to standard or even just plain polarized. Colors really do pop and glare is cut out almost completely. Although these are considered "Liftstyle" sunglasses, I find myself using them snowboarding, biking or playing volleyball over my more expensive athletic pair bought from a different company. Pleasantly surprised and glad I decided to jump off the band wagon and try a new brand. They stick to your head like glue, in a good way. I bought these sunglasses sight unseen. I liked the style and green lenses, however, the POP lenses make the greens, really green, which is cool, but they make some blue skies look like a looming thunderstorm. The earpieces are thick enough to hide traffic when you are changing lanes. I have to lift my head slightly, when turning my head to the left to get a clear view of side traffic. I wouldn't buy this style again, but will continue to wear them until they are unusable. I have owned some cheap sunglasses and am now on my third pair of Smith sunglasses with ChromaPop lenses. Nothing compares! I had to grab a quick pair from a department store after breaking my glasses on a business trip (my fault entirely) and I quickly remembered why I had switched to a quality pair of sunglasses when the squinting and headaches returned. I ordered a new pair from Smith as soon as I could upon my return home. Do your eyes a favor and go with the best. So far have really enjoyed these glasses. Fits great, not to tight, and doesn't feel like they'll fall off your head. Fall fishing is a mix of bright sun and variable light, to low light. The brown CromoPop lenses in my new Smith Outlier sunglasses give me what I need to see the water, fish and flies all day and excel when there are shadows or low light. The frame design is basic but very comfortable and fits snugly. I would recommend this product and plan on letting others try them out. Perfect fit, this is actually my second pair, I liked them that much. You know, I have never been so inclined to write a review in my life. This lens technology in the ChromaPop is the greatest thing since sliced bread. Not only was my face melting, my eyes were melting from pure colorful bliss that the lens provides. Vivid color, next level tracers, landscapes melting, grins from ear to ear. 10/10 for anyone using the ChromaPop with laser light shows, mind blown. Thanks for making such a great product! I have been wearing SMITH sunglasses forever. My first pair was a set of electric blue SL-1's. I've tried some other brands and keep coming back. The outliers were my choice after my beloved Hemi's were smashed flat by a tactical radio after a good run of several years. These glasses in various lens configurations have served me exceptionally well. I have had polarized and non-polarized. I'm a Marine helicopter pilot and Outliers have been my go-to glasses in Afghanistan, across the Pacific and into Africa, and still ride with me every time I take off; they haven't let me down yet. My one complaint is that the lenses scratch a little easily (this coming from two pairs I bought to accompany my last deployment, my replacement pair is over a year old and is still pristine). These sunglasses are awesome. I love the chroma pop, it makes everything crisp, clear, and great to view. I purchased the matte camo with polarized platinum lens and they are super stylish. I have gotten tons of compliments. Definitely a win purchasing these! 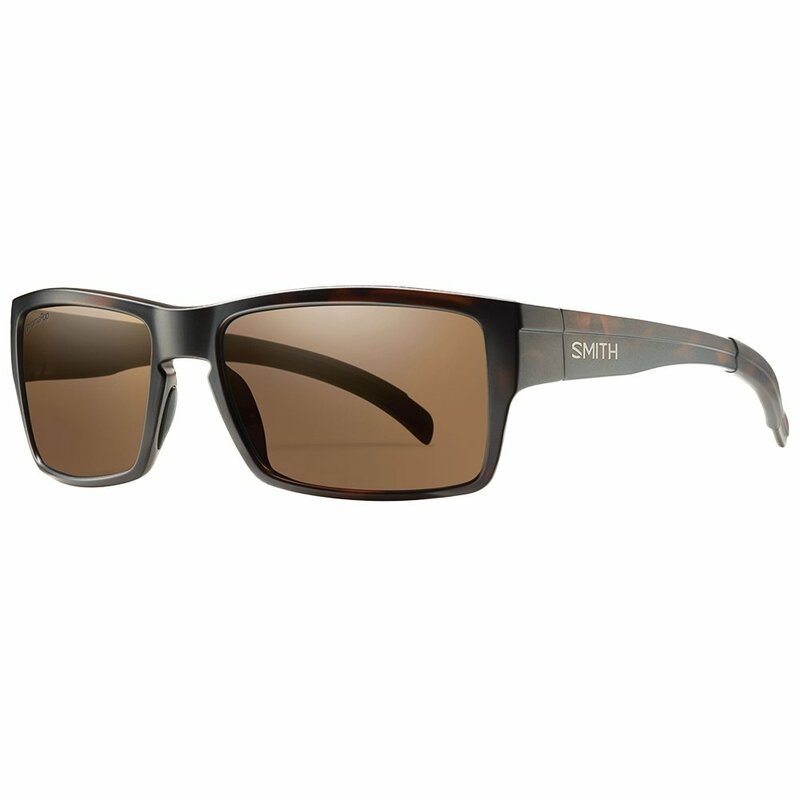 Product: Switching from another brand to Smith Outlier, I am impressed with its ability to improve my vision under sun. This product is perfect for any outdoor activities. After wearing them for week on the beach, I would highly recommend this product. I think my golf game improved as well, shaving off several strokes. It certainly worked for me. These glasses fit great, have appealing style and enhanced color! I love these glasses. They are a great every day frame. Light, comfortable and affordable. Great quality product that holds up over time. Many years ago I was very glad my bike shop turned me on to the Smith Brand. All in all these are some great shades. The only slight issue is that while running they will occasionally bounce. Not that these are sport sunglasses or anything, so I'd expect them not to be optimized for high activity. Would definitely recommend these for your go-to everyday shades. They are a bit tight behind the ear and can cause minor discomfort after long wearing. Otherwise, the style and quality are on par. I love the look of them and how they fit my face. The polarized chromapop lenses really help on the water. I'd buy another pair and recommend to friends. I much prefer these over my cheaper polarized sunglasses. Awesome sunglasses. Fit is great on my small/medium head, and the optics are unmatched. I use my Smiths for fishing in highly variable sun and water conditions and they always perform like no other. I highly recommend these shades for fishing and regular daily use! And the warranty program at Smith cannot be beat! I love these, I just wish the lenses were a little bit darker but that's on me. I chose these for the color of the actual glasses not the lenses. Aside from that, the fit is awesome, the rubber is now a part of the inside of the arm instead of a sleeve like older models. This is nice if you're a fisherman and put croakies on. I love the fit and I love the look. My brother has a pair of the older models, he recommended them to me and I will recommend to anyone else. I bought my first pair of sunnies from SMITH about 5 years ago. That pair has lasted me that long, and I have totally loved them! I just purchased my second set and I'm loving the same style pair but different color even more. Never bought a pair of SMITH? Then you're missing out. All the other brands like Oakley, Ray Band, etc... aren't as quality perfected, but what ever suits you. SMITH, you've made me look good while feeling comfortable and confident. I'm lovin' it! Thank you. This is my forth or fifth pair of Smith glasses. There are great because they feel lighter weight and the really stay put. No sliding up and down your nose. They are slightly smaller eye coverage than I expected from the pictures, but I really like them. I have very pale blue eyes and live in Florida. So, my sunglasses are very, very important to me. I wear them even on cloudy days. These will be a favorite. These are great glasses for anyone hunting, fishing, or just being out on the lake. The chromapop lens are awesome. The clarity and color are amazing! The frame coverage is just right, not to big for someone with a smaller sized face. Looking for some mirrored types lens in the future with the same benefits as the chromapop lens have. SMITH can you help me out with that? Love these shades! Clarity is incredible. Style is stylish. Lots of complements already. Truly a great pair of shades, very stylish with a great fit. I have actually purchased 3 pairs of these. The first pair I had for 4 months leading up to my deployment. Spent 11 months away from the house covered in sand and sweat. These bad boys held up beyond belief. The lenses remained clear and the frame still looked good (minor wear down). The only issue I had was that one of the screws became loose and regardless as to how often I would tighten it down, it would start coming back out. Never lost it though! That being said I purchased two more pairs, one to keep nice and tidy and the other to do all my outdoorsy stuff in. Love 'em and will probably wind up buying another pair.